The Bike Race Free game, developed and distributed by Top Free Games, is a bit misleading with its name. While motorbikes are involved, this free iPhone and iPod Touch app isn’t a race in the traditional sense. Your objective as opposed to normal racing apps, is to see how fast you can complete each track; the quicker you reach the finish line determines how many stars you get, up to a maximum of three. So in essence you are racing against the clock. 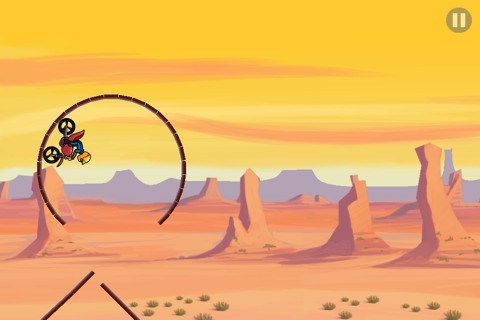 In each track, Bike Race Free has you jump across large chasms and driving through large loops in what can best be described as a physics-based platformer. Gamers who are familiar with the Trials series on both Xbox 360 and PC will feel right at home with Bike Race Free. Bike Race Free offers four different worlds with eight stages each, with each world offering a different theme. For example, the second world has you race through an arctic tundra while the fourth world offers a grassy savanna. The controls in Bike Race Free are intuitive and play to the strengths of the iPod and iPod touch; to accelerate your bike, simply place and hold your finger on the right side of the screen and tilt your device to lean forward and back on the bike. The controls make the game easy to pick up and play, but thanks to a wide array of challenging tracks, Bike Race Free takes awhile to master. Even after beating a track, you’ll find yourself coming back to it again and again either to gain three stars or shave a few more seconds off your time. Combine this with a large number of stages and Bike Race Free is game that offers a lot of replayability; something you don’t often see with a free application. As great as Bike Race Free is, this iPhone app does suffer from a few problems. The graphics, which are colorful, bold and simple, give Bike Race Free its charm; however, the app frequently suffers from slowdown which makes it difficult to control your bike, leading to unnecessary crashes. The sound is another mixed bag. While Bike Race Free features a great main theme and post-level jingle, the sound of the bike falls flat. Rather than a powerful sound of a motorcycle engine, Bike Race Free’s motorcycle sounds like a bicycle with a playing card in the spokes. During the course of this review, Bike Race Free froze a few times on an iPhone 4 using iOS version 5.1. Sadly, your current progress is lost when the game freezes, which can be annoying if you were close to finish a level. 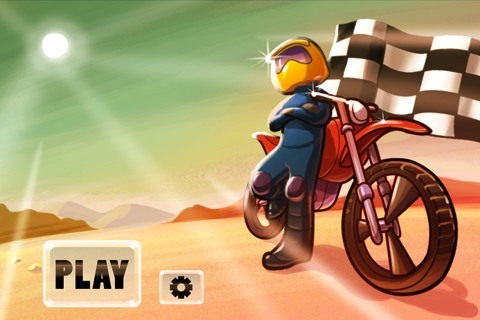 Despite its faults, Bike Race Free is still worth playing and is recommended if you are a fan of motorbike stunt platformer games on the iPhone and iPad. AppSafari review of Bike Race Free was written by Darius Reimm on April 30th, 2012 and categorized under Action, App Store, Free, Games, iPad apps, Racing, Universal. Page viewed 7424 times, 1 so far today. Need help on using these apps? Please read the Help Page. I personally like racing games a lot and so is this game. A complete fun 🙂 Good Job done !